Ideas for elopements, recommitments and small weddings at NH inns. We started our series of blog stories about elopements, small weddings and recommitments at Distinctive Inns of New England (DINE) with a story about packages and offerings from inns in Massachusetts. From there, we wrote about offerings from DINE member inns in Vermont. Today, we’ll focus on fabulous packages for everything from elopements to recommitment ceremonies to honeymoons at DINE member inns in New Hampshire. When it comes to intimate and personalized, there’s no better choice for small weddings than one of the 11 Distinctive Inns of New England. While most member inns offer elopement and small wedding packages, you can always have it your way with the most highly personalized services and celebrations. DINE innkeepers will work closely with you to ensure that every detail is looked after, and the event is just what you’ve dreamed of and more. Starting in Western New Hampshire, the Chesterfield Inn is located just five miles from the Vermont border and Brattleboro and 14 miles from Keene, NH. Offering beautiful common rooms, a patio and wildflower-filled field beyond (in summer months), the Chesterfield Inn is an ideal choice for both the wedding and honeymoon afterward. If you’ve always dreamed of being married in the garden at a romantic New England country inn, this is the place for you; the photos will be unmatched. Intimate weddings from two to up to 60 guests can be held at Chesterfield Inn. Ceremonies can be held outside on the blue stone terrace, surrounded by gardens or inside in front of the fireplace during the cold months. After the ceremony, the attentive Chesterfield Inn staff will serve drinks and hors d’oeuvres to your guests on the terrace, or inside depending upon weather. Then, depending upon your wishes, dinner can be a romantic, candlelit dinner for two for elopements or much larger for all your guests. 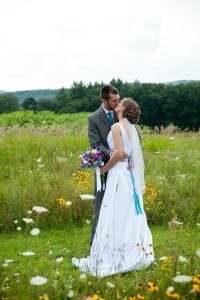 Work with the innkeeper to create a special and memorable finish to your wedding, re-commitment or elopement ceremony. Eloping? 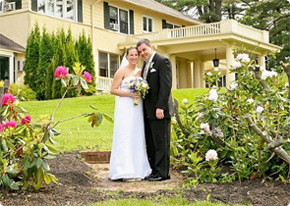 Consider the Chesterfield Inn’s affordable elopement package. The Chesterfield Inn even offers a fabulous proposal package, and will work with you to create the surprises you dreamed of for a very special proposal. Moving over to the Lakes region of New Hampshire, the Manor on Golden Pond is an ideal New Hampshire wedding venue overlooking a beautiful view of Squam Lake, home to “On Golden Pond”. The Manor will present a memorable private affair for just the two of you with their most personal elopement package complete with accommodations, officiants, bouquet, cake, bubbly, romantic 7-course chef’s tasting dinner and more. If you choose to include a few friends and create a small New Hampshire wedding, consider the “Wedding with a few of our closest friends” package, filled with the flowers, officiants, cake, champagne of the elopement package, plus dinner for your friends. For Sunday afternoon weddings with up to 25 guests, your wedding will take place with a backdrop of lakes and mountains in the warmer months or near the fireplace in the cooler months. Enjoy everything included in the other wedding packages, plus a reception for your family and friends. You can download the Manor on Golden Pond’s wedding guide for complete details on the ceremony. Best of all, as a bonus each of the Manor’s packages include a free anniversary cake & champagne when you book a return visit (within 2 years). Whether it’s an elopement, small wedding, an anniversary or spontaneous romantic getaway, any of the Distinctive Inns of New England are ideal choices. To make reservations, click on any of the links below to book direct with these intimate New England inns. In New Hampshire: Manor on Golden Pond in Holderness & Chesterfield Inn in West Chesterfield. This entry was posted in advice, Chesterfield, Chesterfield Inn, Distinctive Inns of New England, Fairy Tale Wedding, honeymoons, Romance, Romantic Getaway, Squam Lake, Wedding and tagged Chesterfield Inn elopement package, elopements at NH inns, honeymoons at NH inns, Manor on Golden Pond elopement package, New Hampshire weddings, NH inn wedding venues, NH weddings, recommitment ceremonies at New Hampshire inns, small NH weddings, wedding packages at Chesterfield Inn, wedding packages at Manor on Golden Pond, wedding venues in NH, weddings at New Hampshire inns, weddings at NH inns by DINE Blogger. Bookmark the permalink.